Here we go, continuing our Top Ten countdown for the most popular audio pieces from the past Fall as counted by your likes and streaming listens. In the past two posts we’ve done numbers 10 through 5, so let’s move on to number 4. One thing I enjoy about this project is that I can’t predict which pieces will get the most response, and in 4th place this past Fall we have my rendition of a excerpt from Gertrude Stein’s arch-Modernist “Tender Buttons.” Not only was it popular last Fall, but it actually improved on its 8th place position from last Summer’s Top 10. Stein’s experiments have to be seen as the forerunner of what came to be known decades later as “Language Poets”—poetry that reveled in the indeterminacy of our language, that exploited all the cracks and odd turns in our real everyday spoken syntax. This poetry can seem intimidating if one is pressed to extract a meaning immediately, but one value of the Parlando Project is that we’re free to perform the poetry with music and allow any straightforward meaning to take a back seat to the sound and flow of the words. And the poetry of “Language Poets” often gains some singular meanings when read aloud, because our everyday spoken syntax is nowhere near as clear as good written prose would be. We commonly understand meanings when words are spoken from inflection and our groupings of words that no diagramed sentence can measure. Musically, I doubled down on the Modernist tilt of Stein’s words by speaking them to my interpretation of the style of Don VanVliet who performed as “Captain Beefheart.” VanVliet took the vernacular freedom of Delta Blues music and expanded on it even further. His own lyrics, like his own music, like Gertrude Stein’s words, don’t seem to make sense at first, until you open up and let them in for awhile, until the off-center is normalized, and you begin to see the facets of the brilliant corners. That journey starts—maybe only starts—when you listen to this piece the first time. At Number 3, we have another returning piece from last Summer, “On the Troop Ship to Gallipoli,” based on my recasting of WWI poet Rupert Brooke’s late fragment, written down shortly before his death on the way to the front in Turkey. If the soldier’s death of Modernist instigator T. E. Hulme (whose “Trenches St. Eloi” was earlier in our Top 10) cost him the opportunity to solidify his position as a founder of British Modernism, Brooke’s death gave him no chance to outgrow or adapt his 19th Century poetics to the new realities of warfare that WWI revealed to many others. So, while maintaining my respect for Brooke’s experience as he wrote it down, I tightened and modernized his language and presentation to create the kind of poem Hulme, F. S. Flint, Ezra Pound, or Siegfried Sassoon would have written. I tried to work the time-worn musical tactic of the slow build in my setting for this one. The final fuzzy musical strain in this is a conventional electric guitar played with an E-bow, a device that magnetically drives a string without plucking it, somewhat in imitation of what a real bow does on a bowed string instrument. At number 2 in our Top 10, we’re back to a piece that hasn’t made a Top 10 before. It just so happens that it’s another adaptation or free translation, this time by Elizabethan physician, poet, musician Thomas Campion. With “Let Us Live and Love” Campion’s first stanza is a faithful enough translation of a poem by the Roman poet Catullus, but he then decided to develop his own path out of that beginning. And so, by the second stanza Campion comes close to coining the Sixties’ slogan “Make Love not War” and he closes with a mighty invocation of love as the great illuminator of our darkness. The Elizabethan age saw a flowering of lute player/composers. Many of them adapted the words of Elizabethan poets as well as writing and using their own poetry. 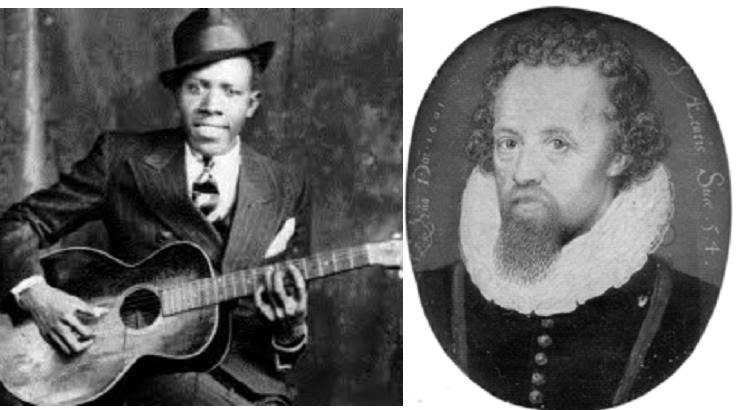 One of Campion’s contemporaries was the great John Dowland, and another was a man named Robert Johnson. A perfectly common name, but a name that many people today associate with another singer/composer/stringed instrument player, the famous Delta bluesman. So rather than using Campion’s own tune, I chose to set Campion’s words to my own Blues tune with slide guitar and harmonica. That leaves only Number 1 to go. What piece was the most liked and listened to here last Fall? Check back tomorrow to find out.